I know, I know - I'm such a phenomenal blogger that I'm posting this great St. Patrick's Day recipe a whole three weeks after the holiday. You know, so you can make them to celebrate the Irish just like I did! I apologize. It is truly unfair of me to taunt you with these glorious cupcakes when there's a whole year between now and St. Patrick's Day. But don't wait to make them! Please, don't wait. You don't need a formal excuse to make these boozy little guys! An Irish Car Bomb is a beer cocktail similar to a boilermaker made with Irish stout, Irish Cream, and Irish whiskey. The name refers to the drink's Irish ingredients - typically Guinness stout, Baileys Irish Cream, and Jameson Irish Whiskey - and the car bombings notoriously used by the Provisional Irish Republican Army (PIRA) during the Troubles. The whiskey is floated on top of the Irish Cream in a shot glass, and the shot glass is then dropped into the stout. Once mixed, the drink must be consumed quickly because it will curdle. So, how do you translate this wacky cocktail into a scrumptious dessert? Chocolate Ganache Filling with Whiskey. 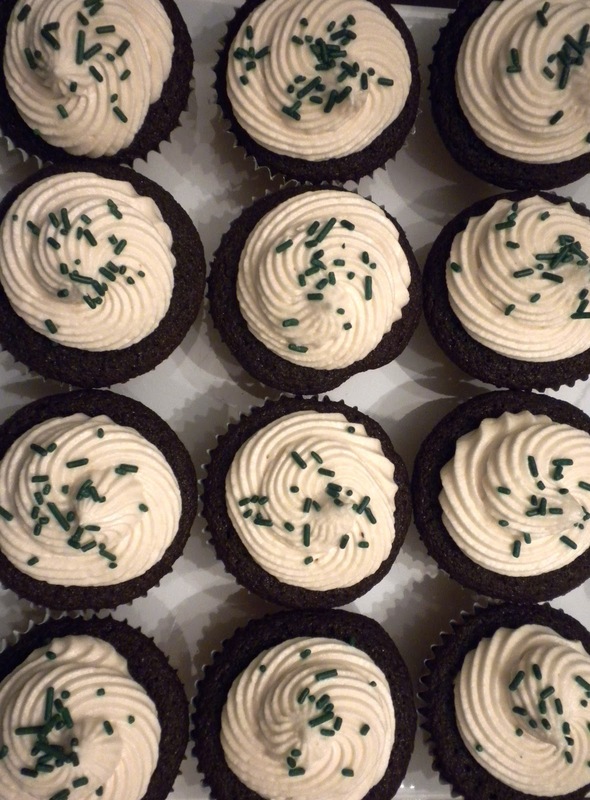 Bailey's Irish Cream Buttercream Frosting. I took these to work on St. Patrick's Day. Do I even need to talk about what a hit they were? I don't think so. These guys are great - not too sweet, moist cake, and you feel like your worlds are colliding because it's both chocolate indulgence and a great 'cocktail'. Yes, that's right. These guys are boozy. Probably not a great idea to make them to send with your kindergartner to his class party. Not only will the teacher start to question your parenting abilities, but she will hate you for intoxicating a group of six year-olds. Sometimes booze and baked goods and kids are okay. I mean, let's be real. The chocolate stout cake by itself? Totally kid-friendly. The alcohol evaporates during the baking process. (Although your children could develop a taste for dark beer...) However, that chocolate whiskey ganache? BOOZE. And that Irish Cream Buttercream frosting? BOOZIER. Especially when I'm making them - I have a bit of a heavy hand. *This chocolate stout cake is great on its own - make the batter as directed here, then bake in a bundt cake pan and pour chocolate ganache (with or without whiskey) over the top to frost. 1 stick unsalted butter, at room temp. 4 oz. (half a brick) cream cheese, at room temp. Divide batter among cupcake liners, filling them 2/3 to 3/4 of the way. I typically use 1/4 cup of batter to fill regular-sized cupcakes, and I did a heaping measurement for these as they don't rise as much. Bake cake until tester inserted into center comes out clean, rotating them once front to back, about 17 minutes. Cool cupcakes on a rack completely. Chop the chocolate and transfer it to a heatproof bowl. Heat the cream until simmering and pour it over the chocolate. Let it sit for one minute and then whisk until smooth. (If this has not sufficiently melted the chocolate, you can return it to a double-boiler to gently melt what remains. 20 seconds in the microwave, watching carefully, will also work.) Add the butter and whiskey and whisk until combined. Let the ganache cool until thick but still soft enough to be piped (the fridge/freezer will speed this along, but you must stir it every 10 minutes). Meanwhile, cut the centers out of the cooled cupcakes. You want to go most of the way down the cupcake but not cut through the bottom — aim for 2/3 of the way. 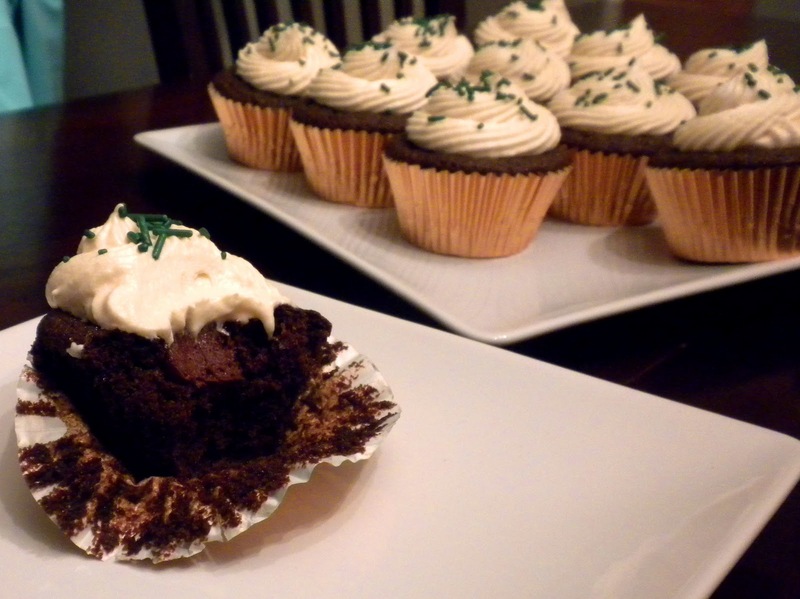 Gotta love a cupcake recipe that lets you taste-test! Put the ganache into a piping bag with a wide tip and fill the holes in each cupcake to the top (a plastic bag with a corner cut off also works just perfectly). Whip the butter and cream cheese (you can also use all butter if you don't have cream cheese) in the bowl of an electric mixer, or with a hand mixer, for several minutes. You want to get it very light and fluffy. Slowly add the powdered sugar, 1/4 cup at a time. Adding the sugar slowly will keep the frosting from getting too grainy and also wind up requiring less sugar to thicken up. When the frosting looks thick enough to spread, drizzle in the Baileys (or milk) and whip it until combined. If this has made the frosting too thin (it shouldn’t, but just in case) beat in another spoonful or two of powdered sugar. I added the Bailey's to taste - I really wanted that flavor to come through! 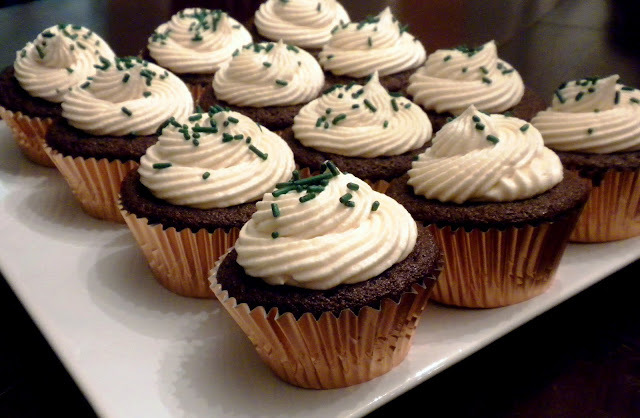 Enjoy the best Irish car bomb cupcakes with the nice taste. You can also learn the recipe and can try it at your own home. With the papersowl reviews you can get the better sense from this zone of the cupcake. Check the whole site for the ingredients.